Thanksgiving is over and it’s time to start thinking about the next round of holiday guests that will be invading visiting your home. 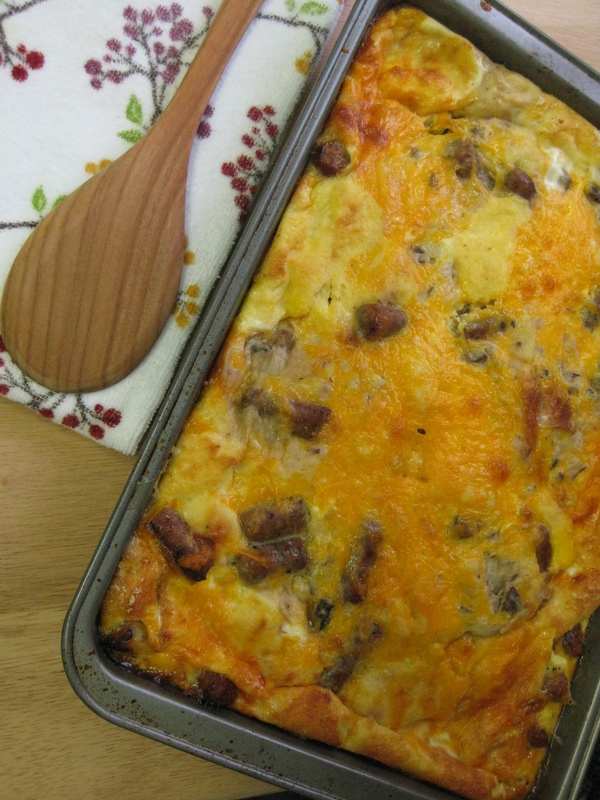 Every Christmas we have this amazingly flavorful, savory bread pudding style casserole. It is perfect because it feeds a crowd, is easy to put together and literally everyone will like it- cheesy, fluffy like a souffle and just down right delicious. We unwrap presents on Christmas morning while this bakes in the background. Generally Santa brings us some chocolates in our stockings that we nosh on during the festivities, so we are just about crashing from a sugar high when this baby is ready to come outta the oven. Bread pudding is notoriously forgiving, so you can really add whatever you like to the dish as long as you use the same base of eggs, milk and bread. I’ve toyed with the idea of using old bay or Cajun seasoning instead of the dry mustard– but I’m such a traditionalist I just can’t bring myself to do it! Grease a 9 x 13 pan. 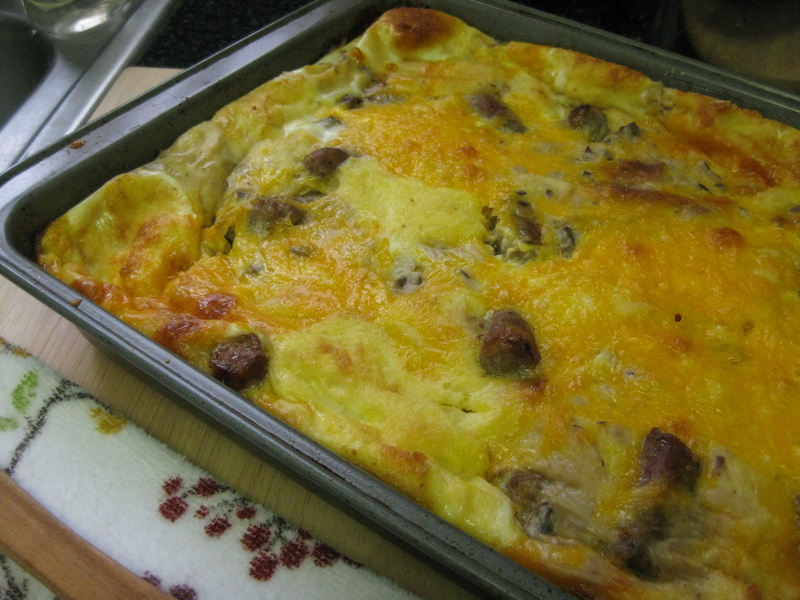 Put in bread cubes, cheese and sausage pieces- mix with your hands. In a separate bowl, beat the 2 1/2 cups milk, eggs, cream of mushroom soup and dry mustard. Pour over the bread and press it down gently with a spatula. Cover and let stand in the refrigerator for several hours of overnight. *Note: I have cooked this for 1 hour 15 minutes in a 325° oven and was successful, but it didn’t retain it’s fluffiness quite the same. This entry was posted in baking, breakfast and tagged bread pudding, breakfast, brunch, Christmas, cooking, food, guests, holiday, parties, seasonal. Bookmark the permalink. This sound similar to an egg bake my Aunt makes for Christmas brunch. 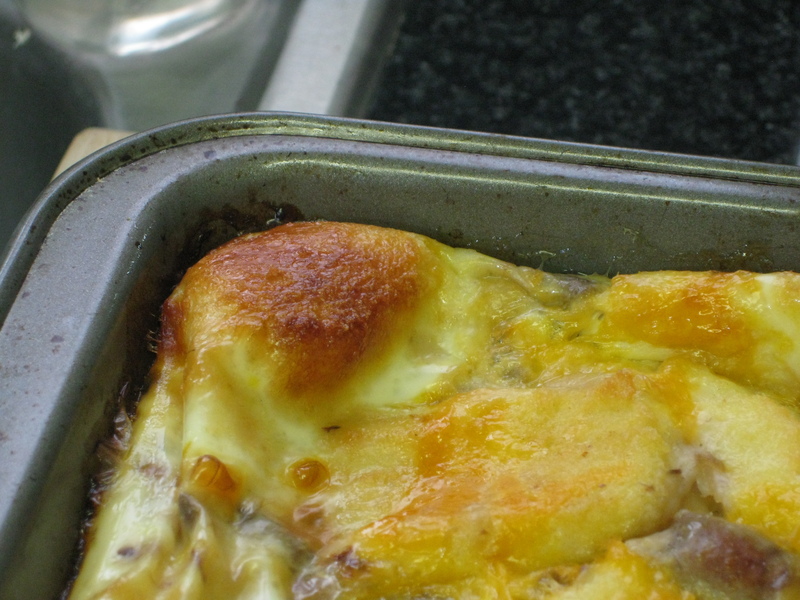 Casseroles like this are so tasty and perfect to serve a holiday crowd. Yours looks great!